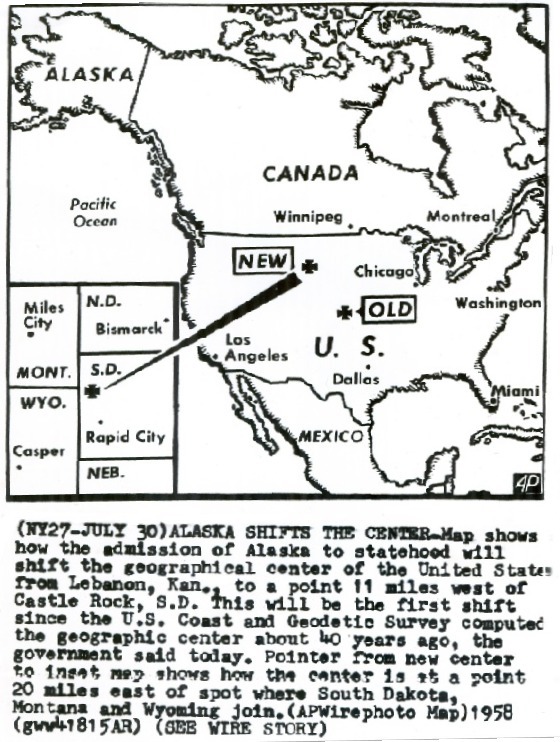 The designation for Castle Rock as the Geographical Center of the United States came in 1958 and lasted only one year. When Alaska was added to the Union, many felt that the 49th state should be included when determining the geographical center location. 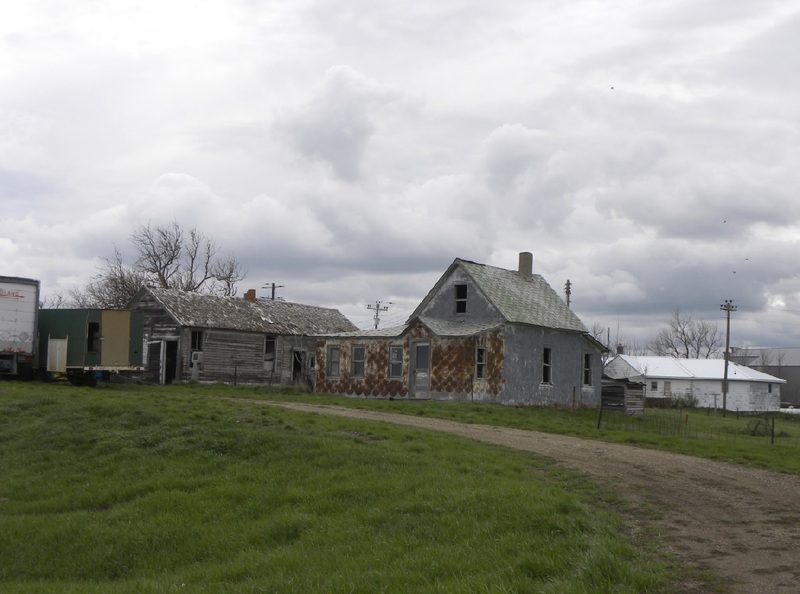 This prompted a major shift from the long-held location at Lebanon, Kansas. This shift was not made without a considerable amount of protest by those in Kansas, so the monument already established at Lebanon continued to bear the name as the geographical center of the "Continental United States". 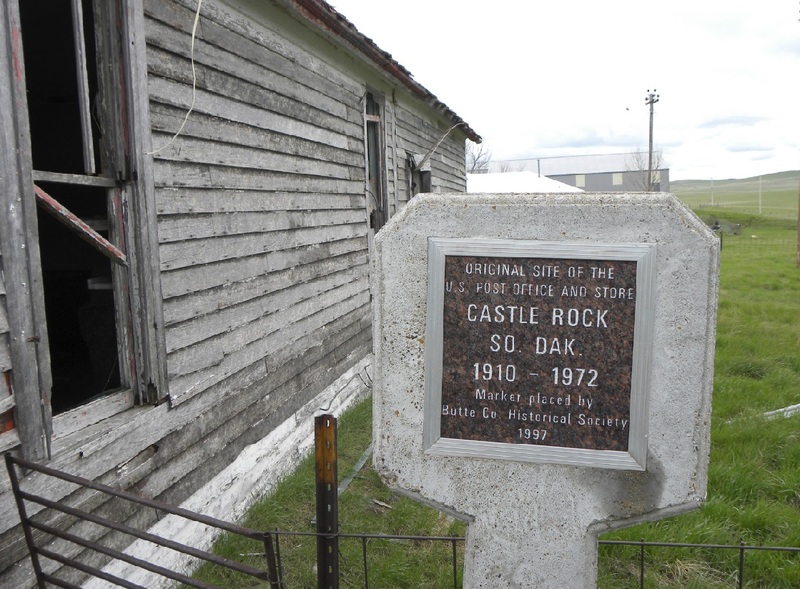 Castle Rock is a location that is still shown on current South Dakota transportation maps, but aside from a couple of houses and a few abandoned buildings, one would barely notice the location when passing by on Highway 79. 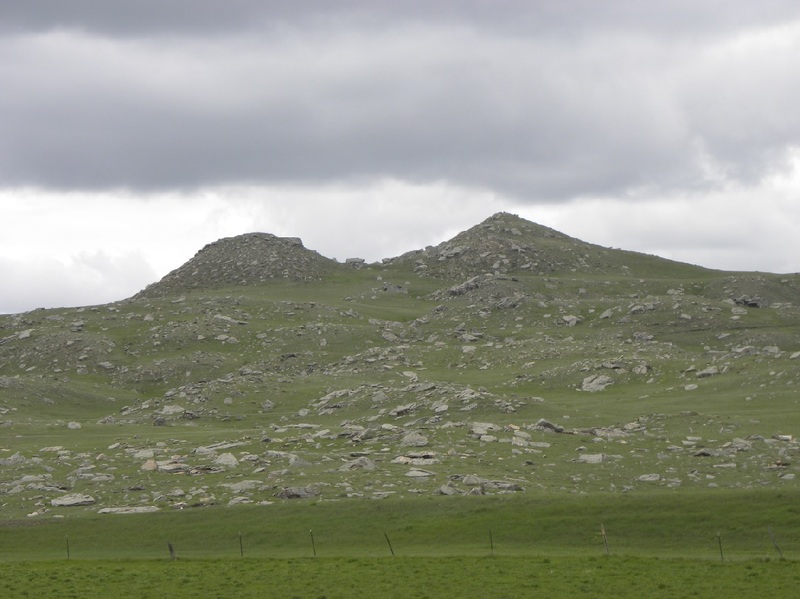 The position by latitude/longitude was actually 10 miles west of Castle Rock near a prominent landmark known as "Two Top Butte". Due to the absence of any other nearby town, Castle Rock received the distinction. The new designation at Castle Rock was barely settled when the addition of Hawaii, in 1959 as the 50th state, prompted a new shift. 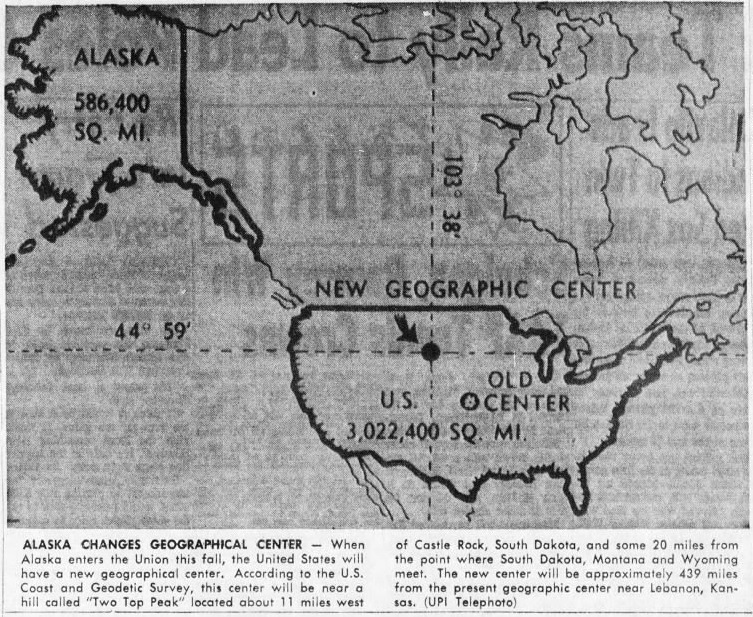 Mathematicians decided that the location should now be 6.5 miles further west when all 50 states were considered to determine the geographical center location. Castle Rock was still technically the closest town to the revised location, being about 17 miles to the east, but many felt the designation would be better named by having the designation as Belle Fourche which was about 21 miles to the south. The new site was likewise in the middle of nowhere, but was very close to Highway 85 as it existed at that time. 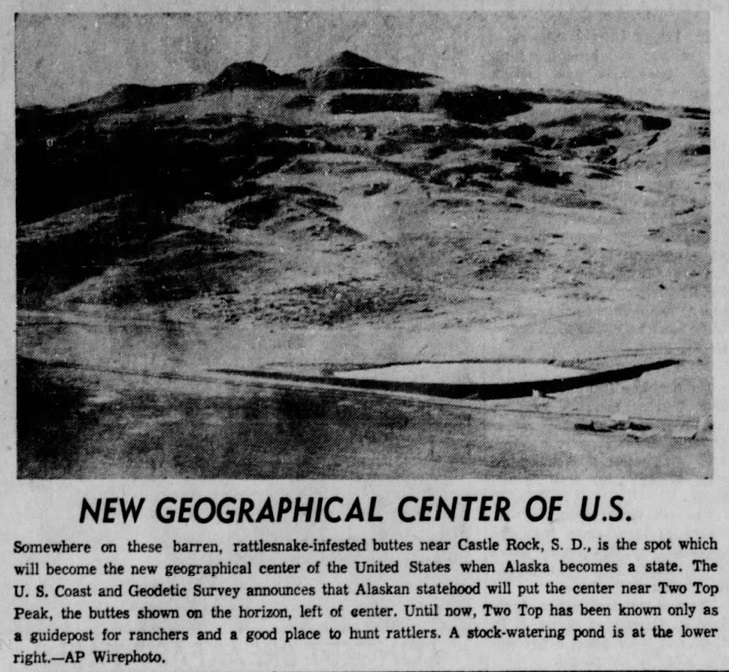 A roadside park was built at the new location and any mention of Castle Rock as being at the geographical center faded just as quickly as it had appeared. The approx. 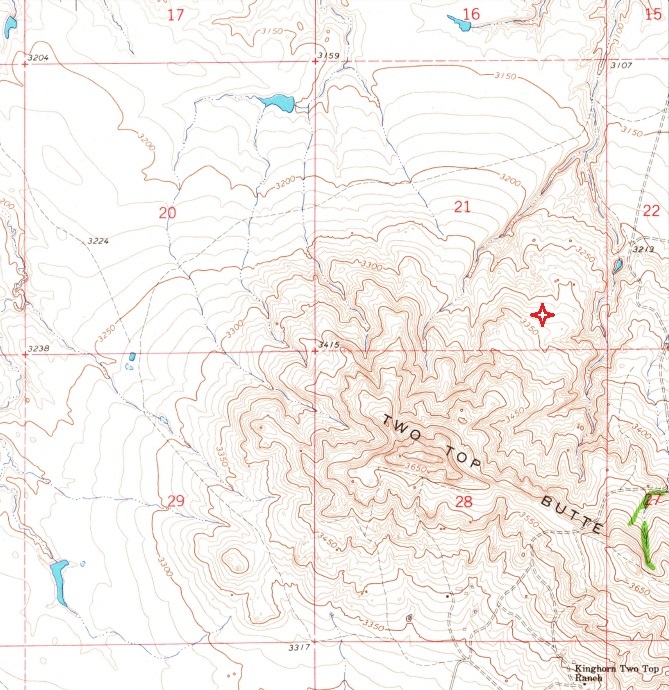 location, as shown by the red four-pointed star, at 44�'N / 103�'W near "Two Top Butte". No marker was ever placed at this location. Two Top Butte as viewed while looking west from Highway 85. Remaining structures at the town of Castle Rock along Highway 79. Historical marker sign at Castle Rock. 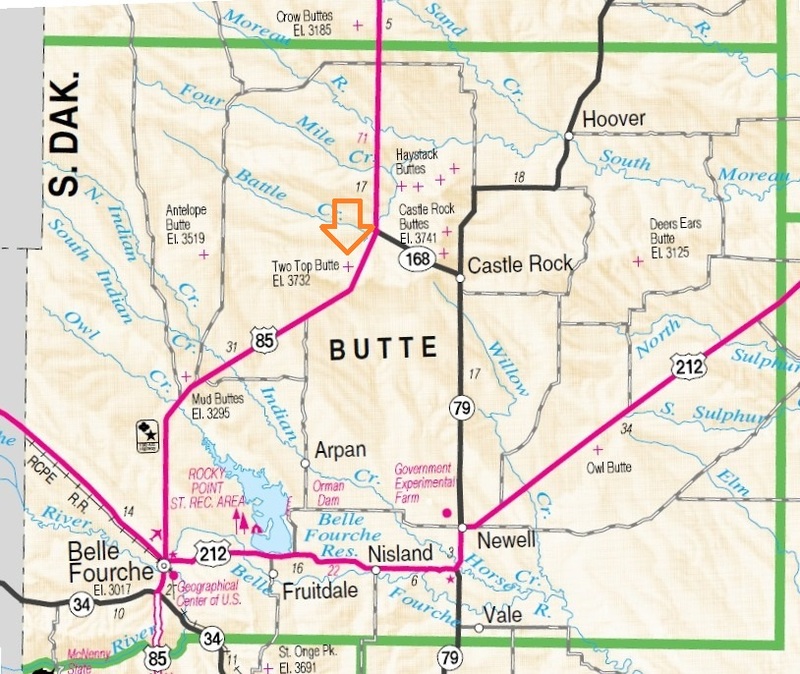 A modern South Dakota transportation map showing the location of Castle Rock, "Two Top Butte", and Belle Fourche. South Dakota Department of Transportation Map 2015. Valley Morning Star. Harlingen, Texas. 8/02/1958. The Lacrosse Tribune. Lacrosse, Wisconsin. 8/02/1958. Associated Press Wire Photo. August 1, 1958.